Is AMD's new triple-core chip a winner? Put yourself in AMD's shoes. Things haven't been going to plan. Your crucial quad-core chip arrived late, ran slow and had a nasty little hardware bug. What's more, you're being beaten silly by Intel's Core 2 processors. What do you do? How about a triple-core chip to distract attention from the mess you're in? That's the cynical take on the launch this week of the Phenom X3, the new triple-core revision of AMD's Barcelona processor architecture. And it's not entirely fair. It might be true that the X3 would not have happened if the Phenom project as a whole wasn't floundering. But it's still a smart move by AMD and presents punters with an intriguing new alternative. For starters, it gives AMD a unique sales pitch and a product that neatly transcends the direct comparisons that have been so unflattering for the initial quad-core Phenom X4 models. Indeed, it's extremely unlikely that Intel will copy it. Intel's quad-core processors are actually composed of a pair of dual-core dies sandwiched into a single package. Creating a triple-core model would therefore require some fairly hideous hackery. But even if it didn't, such is Intel's crushing dominance, it's doubtful it would bother. Let AMD have a monopoly on triple-core products. See if Intel cares. More to the point, by pricing the new X3 range to take on dual-core Intel Core 2s, AMD probably reckons it can offset Phenom's core-for-core performance disadvantage. If the X3 delivers more bang for your buck, what do you care whether the whole triple-core thing is a bit of a gimmick? What really matters is the performance it pumps out, not how it's achieved. So, is the new Phenom X3 actually a chip we can actually recommend? Certainly we're pleasantly surprised to find that retail examples of AMD's triple-ganger sport the all important '50' suffix. That indicates they're based on the latest B3 spin of the Phenom architecture and hence free from the infamous TLB bug. As we've reported earlier, the BIOS work around AMD implemented to patch the bug typically sapped performance to the tune of 10% and sometimes as much as 30%. 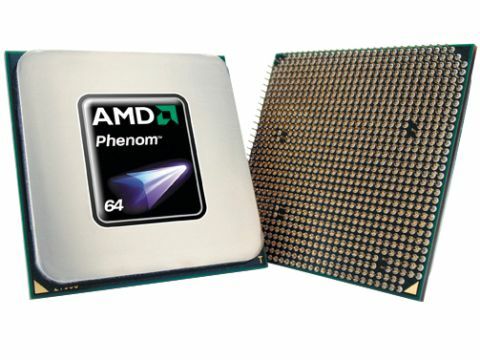 It seems the “buggy” B2-based Phenom X3s that AMD announced a few months ago are destined to go only to system builders and won't be sold as boxed processors. Hence in almost regards save core count, the new X3 Phenoms are identical to the latest revision of the X4 line. In fact it's based on precisely the same quad-core processor die but with one core disabled. With that in mind you might think the X3 is an effort to increase yields and profitability by rescuing dies with one dud core from the scrap heap. But apparently not. When we put that very question to AMD it was flatly denied. Whatever, our first experience of the X3 comes in the form of the 8750 model. At 2.4GHz its the quickest option at launch and like other Phenom X3s packs 512K of L2 cache memory per core and a shared pool of 1.5MB of L3 cache. It's also a socket AM2+ chip and in theory is compatible with the large installed base of AM2 motherboards. In practice, we strongly recommend you consult you board's maker before assuming it's good to go for X3s. But how does it perform? For the most part, just as you would expect for a Phenom chip short on cores to the tune of one. In heavily multi-threaded applications such as video encoding or professional rendering, the benefit over competing dual-core Intel processors is clear to see. The X3 8750 is quicker than the price-parity Core 2 E6750 in such workloads. That said, it's worth noting that some multi-threaded apps like Window Media Encoder are currently foxed by the odd-numbered core count and will only make use of a pair of the cores. It's a minor glitch that's likely to be addressed in the near future. But there are two more serious counts on which the X3 fumbles. Firstly, in single and dual-threaded software, including the vast majority of games, it's much, much slower than the Intel competition. But even more troublesome is the close proximity of the X3's quad-core sibling in AMD price list. Precise UK retail prices will emerge over the next week or so. But it certainly looks like the premium for an identically-clocked X4 chip will only be around £20. Add another £10 and you're in Intel quad-core territory. All of which means the X3 is an interesting new option that just needs a little shaved off the asking price to really make sense.